Christmas music is playing in the background, good smells are filling my house as I am getting a head start on our Christmas dinner, Luke is sleeping and the kids are making messes wherever they go, but it's okay because it's only 3 more days till Christmas!!! Are you feeling the excitement?! Are you still running around trying to get Christmas presents or are you enjoying this festive time!? No matter how old I get, I still think I will be excited about Christmas. Giving gifts is one of my love languages and I just love seeing my children and loved ones open their gifts. I really have to hold myself back. I love how excited my children get and how they ask me each day, "How many more days till Christmas?!" We are trying to fight off some sniffles and sore throats these days but since I can't join in on some of the events we had planned this week I am taking advantage of our quarantine and making as many dishes as possible before Christmas. This dinner is my gift and labor of love for my family. Because you just have to have good homecooked food on Christmas. I thought I would drop in and share with you what I am making if you are scratching your head still, wondering what you are going to make for Christmas. If you are visiting friends and family and only need to bring a side or you are hosting the whole gang I hope my menu will give you some inspiration. I have made these recipes numerous times over the years so be assured that they are tried and true recipes that will leave your tummy satisfied and your taste buds happy. I have shared when I make each dish. I like to spread the cooking out during the week so I am not overwhelmed on Christmas. 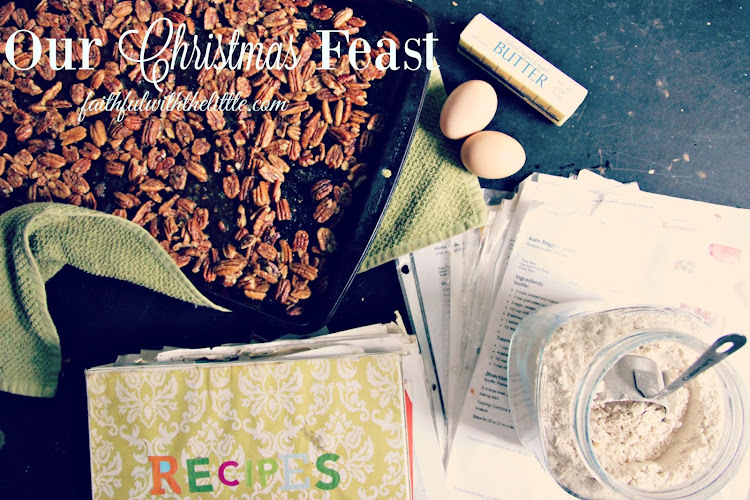 And really, who wants to be cooking all Christmas day? Not me! I have actually been on strike from cooking lately to prepare for all the cooking I am going to be doing this week. Thankfully I have all my food shopping done. I hope you do too because it's crazy out there people. I do not want to step foot in another store for a long time. Since I have spread all my cooking out through the week I know it will be a lot easier on me. What I usually forget is that not only do I have to make all the food but there is all the cleaning up to do. Somehow making even one dish can cause piles of dishes to need cleaning. So I am cleaning as I am going and finding I am enjoying the cooking way more than I would if there was a mess everywhere. My mom is of course bringing a dish to share and friends that are coming are also so I know we will have plenty of food. I would much rather have too much than too little. And I am really looking forward to having leftovers for at least a few days. Seeing as my family devours food very quickly I am not sure how long they will last us. Hope this menu inspires you to get in the kitchen and give your family the gift of full and happy tummies! This sounds like it was fantastic. I love Christmas. I had never thought of it that way but I think my love language is giving gifts. I spend a lot of time thinking about people and what they may like and I am so excited to give them out on Christmas day. This year my older sister said they just want to do a drawing next year and I felt disappointed. I love giving gifts and the idea of not giving my nieces and nephews gifts makes me a bit sad. I hope you had a wonderful holiday and I look forward to reading your posts next Wednesday at Sitting Among Friends.